Take a look at faucets for leaks by confirming there is no water escaping around the connections when faucets are shut off. If new leaks are found, install new fixtures or repair where the leaks are in order to prevent damage and improve your water bill. Then look for pipes visible anywhere in your home like under sinks or in the basement and repeat the procedure above. Look for leaks in both the bowl and tank. If everything looks good, place a half a dozen drops of food dye into the tank. Wait to see if the dye ends up in the bowl itself. If there is color in the bowl after an hour, you could have a leak in the system which needs to be checked out by a professional. Newer water heaters are more efficient, so check to see how old yours is. Generally, it’s good to begin thinking of a new one if it is 15 years old or older. Regardless of its age, there are a few things you can do to make sure it is running at its peak. To make sure you are spending less money on your energy bill, make sure the water heater is set no higher than 120 degrees. Additionally, for safety reasons, move any items around the water heater away from the unit. This may also increase efficiency. For all appliances like your dishwasher, washing machine or ice maker, check your water supply hoses for leaks or bulging. If hoses are older than ten years or showing signs of weakness, replace them completely. Use stainless steel hoses which are stronger, more reliable and less prone to wear and tear like other hoses. In addition, to ensure that no material is finding its way into your plumbing and piping system, check the lint trap on your washing machine. Make sure there is one equipped and then place a wire trap or pantyhose on the end of hose that drains water out of the washer. To make sure your sump pump is operating effectively, pour a bucket of water into the pit where the sump pump sits. The sump pump should immediately activate, drain the water, then deactivate. If it doesn’t do this, you know you have an issue with the unit that needs to be addressed. Don’t forget to go outside and check on the various pipes and drains that surround your home. Make sure any yard drains, gutters, or downspouts are clear and open of any debris. Look for anything blocking any vents. Check exterior faucets to make sure the water is flowing properly and that there has been no piping that needs to be replaced due inclement weather. Water may leak out of faucet if there is a problem the first time you turn it on. 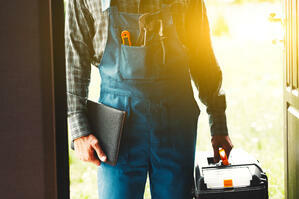 Once you have worked through this checklist, you are off to a good start to ensuring your plumbing system is healthy and ready for the spring and summer weather. If you do find something that you don’t feel comfortable assessing or fixing, please feel free to call us for help!